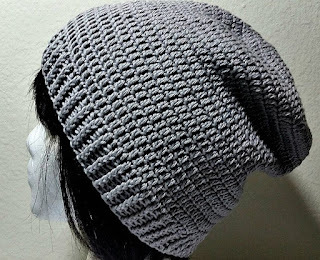 This is a beanie that I created last year but forgot to write up the pattern. I really like it because it is made with a cotton and acrylic blend yarn that has such a beautiful drape. It is perfect for spring and summer as it is a breathable fabric. FYI, you will be going in a spiral so no need to sl st after each round. Round 10 - 25 Dc in each stitch around. (109 dc) At round 25 (last round) dc around until there are 3 stitches left in the round, hdc, sc,then sl st in the last stitch. Ch 2 in that last stitch. Round 27 - 30 Repeat round 26. (109 stitches.) Fasten off and weave in ends.